Nursing students who are working in health care facilities or providing any type of healthcare services for remuneration are deemed unlicensed assistive personal. Although enrolled in a prelicensure nursing program, the student does not possess the licensure status required for assuming the roles and responsibilities of a registered or practical nurse in the employment setting. 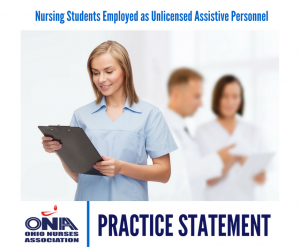 The trained unlicensed person, including those individuals classified as student nurse, may perform tasks that are delegated to them by a licensed nurse in accordance with the rules of delegation as outlined in the Ohio Administrative Code 4723-13-05. While working as unlicensed assistive personnel, the student nurse may not use the term “nurse” or any term that would imply that they are a licensed nurse (Ohio Revised Code 4723.01 and 4723.43). Healthcare facilities that allow or encourage nursing students to accept and perform tasks beyond those tasks normally delegated or within the appropriate training of an unlicensed assistive individual may be guilty of abetting the unlawful practice of nursing. Additionally, the academic institution in which the student is registered is not required to provide supervisory oversight nor has responsibility/liability for the student’s actions as an employee of a health care facility.